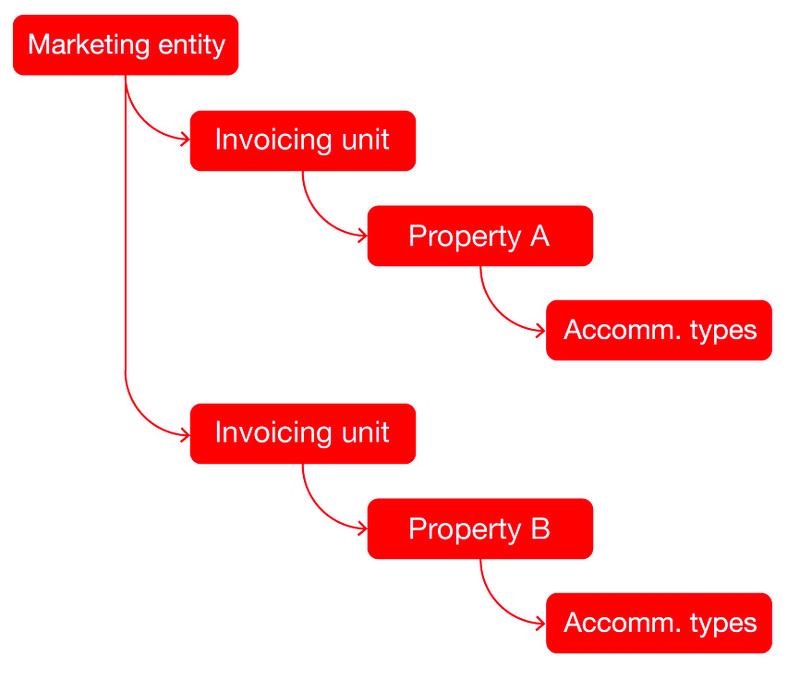 Any level on the structure from property and above can be classified as an invoicing unit. . This enables you to be extremely flexible in your business structure setup. However, the marketing entity should never be set as an invoicing unit and a property should never be set as an invoicing unit unless it is a ‘Property only’ invoicing unit. The information set up on an invoicing unit determines the system’s invoicing document details and certain default functionality when it comes to generating invoices. Setting a level as an invoicing unit will involve consideration of your business processes and accounting requirements. Here are some examples of how this can be set up. If all properties are invoiced through one entity, then the reservations for all properties would be on consolidated into one invoice, including any charges for extras purchased at the property, e.g. Extras. 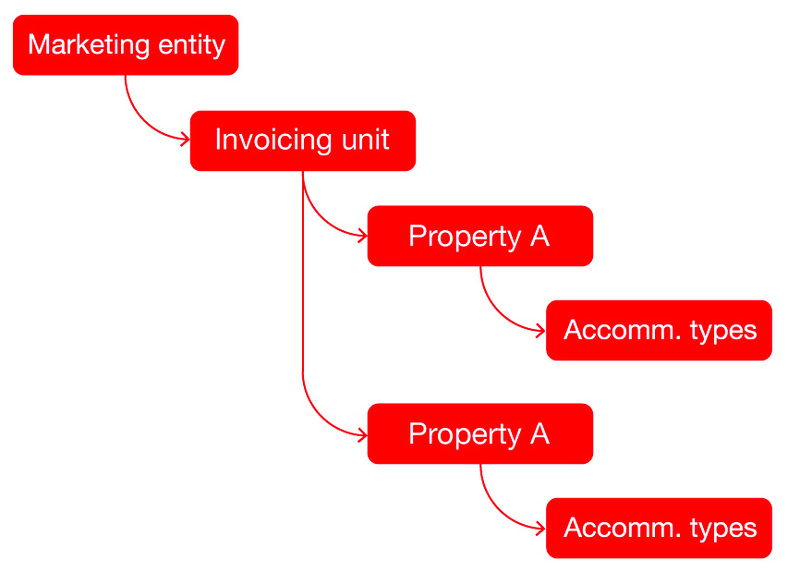 If you require each property to invoice independently, the setup would look like this (see image below). Charges for each property will reflect on separate invoices on a booking with multi property itineraries. Certain information is required for a level to be set as an invoicing unit and which enables the invoicing process. This ensures the level is not an invoicing unit. This means that all charges, whether raised on a Reservations server or a Property server will fall under this invoicing unit.. This means that only charges raised on Reservations servers will fall under this invoicing unit. This means that only charges raised on the applicable property server will fall under this invoicing unit. GL currency Select your General Ledger currency from currencies already set up in Currency code tables. Invoice options button This filter enables the user to set up defaults for invoice documents, e.g. reservation details. Invoice prefix This is the set of letters that will precede the invoice number on your documents. Invoice number format is EEPPPnnnn, where EE = environment, PPP = invoice prefix and nnnn = automatically generated sequence number. Invoice start number This field allows you to start your invoice numbers at a specific number. Future invoices This setting permits or restricts the user from processing invoices dated in the future. The ‘Same as default’ option means that the setting in the Financial system Defaults will be applied. If future invoices are not permitted then users will be prompted to change the date to today or before today’s date when generating an invoice. Financial logo Click on the image icon to see which logo is being applied to financial documents. Send logos to the Support team who will load them for you as you can not load them from here. For more information, see the Logos tutorial. Show tax on proforma The default setting to show tax on the proforma invoice documents can be set on the Documentation Defaults tab, but this rule can be overridden here to allow/not allow tax to reflect on your proforma document. Show Tax Table If selected, invoices will include a table showing the total tax amounts per tax rate. Tax on invoice: Tax display & order If you have multiple taxes set up, here you may specify in what order and how you would like your taxes to reflect within the tax table. Bank details Only Banks and Cash Points that have been linked here can be used when recording receipts for the invoicing unit. Multiple bank accounts / cash points can be linked. To add a bank account to an invoicing unit, click the ‘Allocate Bank’ button (a list of Banks stored in the Bank code table is displayed), from the pop-up click on the required bank to add to the property. Once the bank is added, a delete button is available to remove the bank. Statutory number fields Free format fields for any statutory details applicable to the company, such as company registration number, VAT number, VRN and TIN numbers can be reflected here. The numbers entered here are displayed on documentation headers. The labels for these fields can be inherited from the Financials Defaults tab or they can be changed here specifically for the invoicing unit.